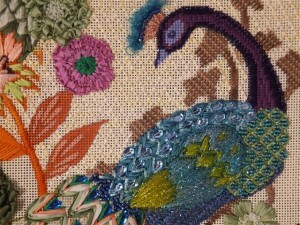 We spotted this canvas during the Maggie trunk show this fall and thought it would be perfect for a class. Aggie took it home and worked her magic. 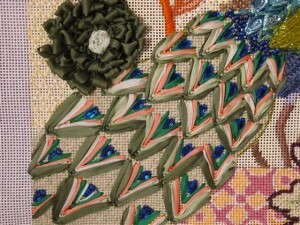 As you can see, it is filled with all sorts of ribbons and ribbon techniques, sequins and interesting beads and is a blast to stitch! The classes are Saturdays: February 23, March 9 and 23 from 10-12. Call the shop (203-210-5107) for more details and to sign up! 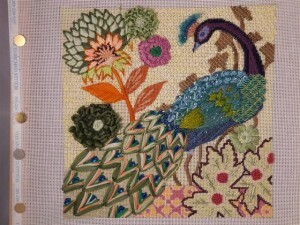 This entry was posted in As the Needle Turns, Stitch Guides.